Linkin Park lead singer Chester Bennington has died, the Los Angeles County coroner confirmed to CBS News Thursday. He was 41. Early reports from TMZ claimed that Bennington's death was the result of suicide and that he had hanged himself. His body was found at his home in Palos Verdes Estates, California. Band-member Mike Shinoda confirmed the news of Bennington's death on Twitter, explaining that a full statement would come later. "Shocked and heartbroken, but it's true," he wrote. "An official statement will come out as soon as we have one." Warner Bros Records, the band's label, released a statement from CEO Cameron Strang. "Chester Bennington was an artist of extraordinary talent and charisma, and a human being with a huge heart and a caring soul," Strang wrote. "Our thoughts and prayers are with his beautiful family, his band-mates and his many friends. All of us at WBR join with millions of grieving fans around the world in saying: We love you Chester and you will be forever missed." Phoenix native Bennington joined Linkin Park in 1999, and the group quickly rose to fame with hits like "Crawling," "In the End" and "Faint." The band's debut album, 2000's "Hybrid Theory," was certified diamond by the Recording Academy, meaning it sold more than 10 million copies in the United States. With the Grammy-winning band, Bennington sold millions of albums with a unique mix of rock, metal and rap. In 2004, the band collaborated with Jay-Z on the EP "Collision Course." Bennington was a close friend of Soundgarden singer Chris Cornell, who committed suicide earlier this year. Thursday would have been Cornell's 53rd birthday. Bennington is survived by his wife, Talinda, and six children from two different marriages. Linkin Park released their most recent album, "One More Light," in May. The album became the band's fifth No. 1 debut on the Billboard 200, but both fans and critics were divided, with complaints that the sound leaned to heavily on pop. "If you like the music, fantastic. If you don't like it, that's your opinion, too. Fantastic," Bennington told NME magazine. "If you're saying we're doing what we're doing for a commercial or monetary reason, trying to make success out of some formula ... then stab yourself in the face." 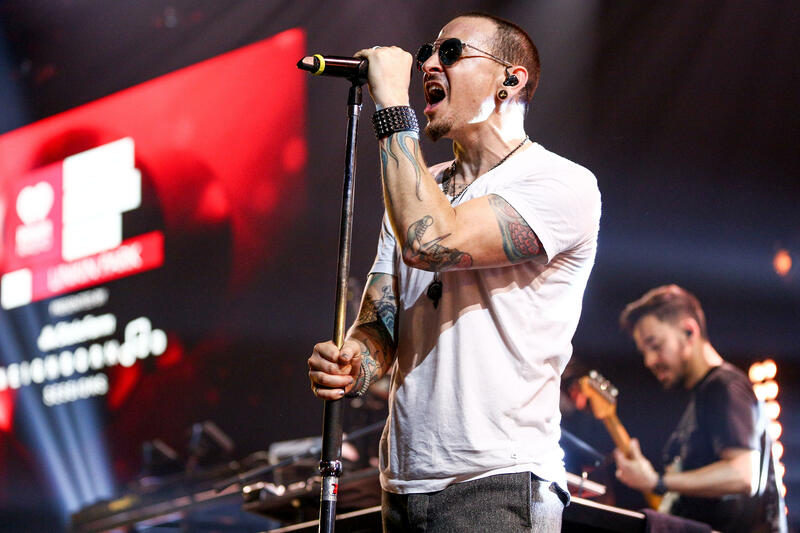 Linkin Park was in the middle of touring when the news of Bennington's death broke. They were scheduled to perform at New York's Citi Field with Blink 182 next week. Earlier Thursday, the band had celebrated the release of a new music video for the single "Talking to Myself."